Mark A. Welsh III was born in 1953 in San Antonio, TX. He entered the U.S. Air Force in June 1976 as a graduate of the U.S. Air Force Academy. He has been assigned to numerous operational, command and staff positions. In recent years he served as Vice Commander, Headquarters Air Education and Training Command, Randolph AFB, TX, and as Associate Director of the Central Intelligence Agency for Military Support and Associate Director for Military Affairs, Central Intelligence Agency, Washington, DC, from August 2008 to December 2010. 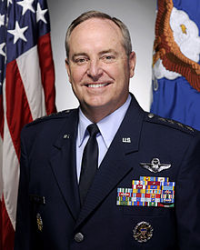 On 13 December 2010, Welsh was promoted to the four-star rank of General and assigned as the 34th Commander, U.S. Air Forces in Europe; Commander, Allied Air Command Ramstein, Germany; and Director, Joint Air Power Competence Center at Kalkar, Germany. From August 2012 to the present, Gen Welsh has been serving as Chief of Staff, Headquarters U.S. Air Force, Washington, DC. August 1976 - July 1977, student, undergraduate pilot training, Williams Air Force Base, AZ. July 1977- January 1981, T-37 Instructor Pilot and Class Commander, Williams Air Force Base, AZ. January 1981 - May 1981, student, fighter lead-in training, Holloman Air Force Base, NM. May 1981 - August 1981, student, A-10 training, Davis-Monthan Air Force Base, AZ. August 1981 - May 1984, Instructor pilot, flight Commander and wing standardization and evaluation flight examiner, 78th Tactical Fighter Squadron and 81st Tactical Fighter Wing, Royal Air Force Station Woodbridge, England. May 1984 - June 1987, Commander, Cadet Squadron 5, later, Executive Officer to the Commandant of Cadets, U.S. Air Force Academy, Colorado Springs, CO.
June 1987 - June 1988, student, Army Command and General Staff College, Fort Leavenworth, KS. June 1988 - October 1988, student, F-16 conversion training, Luke AFB, AZ. October 1988 - July 1992, Operations Officer, 34th Tactical Fighter Squadron, later, Commander, 4th Tactical Fighter Squadron, Hill AFB, UT. July 1992 - June 1993, student, National War College, Fort Lesley J. McNair, Washington, DC. June 1993 - June 1995, Chief, Defense and Space Operations Division, Operations Directorate (J3), Joint Staff, the Pentagon, Washington, DC. June 1995 - April 1997, Commander, 347th Operations Group, Moody AFB, GA.
April 1997 - June 1998, Commander, 8th Fighter Wing, Kunsan Air Base, South Korea. June 1998 - June 1999, Commander, College of Aerospace Doctrine, Research and Education, Maxwell AFB, AL. June 1999 - September 2001, Commandant of Cadets and Commander, 34th Training Wing, U.S. Air Force Academy, Colorado Springs, CO.
September 2001 - April 2003, Director of Plans and Programs, Headquarters U.S. Air Forces in Europe, Ramstein AB, Germany. April 2003 - June 2005, Director of Global Power Programs, Office of the Assistant Secretary of the Air Force for Acquisition, Headquarters U.S. Air Force, Washington, DC. June 2005 - June 2007, Deputy Commander, Joint Functional Component Command for Intelligence, Surveillance and Reconnaissance, U.S. Strategic Command, Bolling AFB, Washington, DC. July 2007 - August 2008, Vice Commander, Air Education and Training Command, Randolph AFB, TX. August 2008 - December 2010, Associate Director of the Central Intelligence Agency for Military Support/Associate Director for Military Affairs, Central Intelligence Agency, Washington, DC. December 2010 - July 2012, Commander, U.S. Air Forces in Europe; Commander, Air Component Command, Ramstein; and Director, Joint Air Power Competency Center, Ramstein AB, Germany. August 2012 - present, Chief of Staff, Headquarters U.S. Air Force, Washington, DC. June 1993 - June 1995, Chief, Defense and Space Operations Division, Operations Directorate (J3), Joint Staff, the Pentagon, Washington, DC, as a Lieutenant Colonel and a Colonel. June 2005 - June 2007, Deputy Commander, Joint Functional Component Command for Intelligence, Surveillance and Reconnaissance, U.S. Strategic Command, Bolling AFB, Washington, DC, as a Major General. August 2008 - December 2010, Associate Director for Military Affairs, Central Intelligence Agency, Washington, DC, as a Major General and a Lieutenant General. December 2010 - present, Commander, U.S. Air Forces in Europe; Commander, Air Component Command, Ramstein; and Director, Joint Air Power Competency Center, Ramstein AB, Germany, as a General.